"Things with Wings" Then head on over to Sugar Creek Hollow and link up with us! I used the Gecko Galz digital paper pack Hocus Pocus. I created a bat template in Inkscape, and then used it to cut out the digital papers. I used some fabulous ribbon and trims from Really Reasonable Ribbon to decorate my Halloween Bat and make it "SpOoktaCularLy VinTage." I used some of my favorite jewelry wire to create the hanger, along with some beads and Swirl Orange ribbon to create a fabby little bow. I used my crop o dile to punch some holes to thread the wire through, and to add a little Halloween surprise to the bottom of the bat. and a antique bronze bat trinket finish off the bottom of my Halloweeny Ornie. I just love how the bat itself turned out. I used the orange stripe "Hocus Pocus" digital Paper from Gecko Galz for my background. Next I glued down many fabby trims from Really Reasonable ribbon, starting off with the 1.5" Black netting, then the vintage Penelope lace trim, added some of the May Arts black leaves, and pumpkins. I found a vintage black button added some of the spooktacular orange mini pom pom trim and Halloween baker's twine to spice it up! It is going to look fabulous with the other Halloween Goodies on my Halloween tree! We have a fun challenge this week at Sugar Creek Hollow!! We would love to see you use "Vintage Animals or Vintage Animal Scenes," in your vintage or shabby chic style creations! I knew right away what images I wanted to use. Leanne, at Gecko Galz has some fabulous Ephemera new this month just perfect for this challenge! I chose two images from the Autumn Days Collection. Anyone who knows me IRL knows that I love animals, and I really LOVE squirrels. So when I saw this photo with all the cute little critters gathering up their fall harvest, I knew it was the image for me! I started out printing out two of the Hocus Pocus digital papers from Gecko Galz. I used one for my card base and the other I punched to add something pretty at the top of my card. Next I used Inkscape to create a cut line around my image, duplicated it, offset it, and filled it with a color from the image. This is how I got the layer between my image and card base. I used that same color to form the tiny text boxes as well. HOPEFULLY this Sunday I will get some cleaning done so I can find my new blade for my Black Cat Cougar, so I can use it to cut out my goodies instead of my scissors...LOL. Here you can see how I used inskcape again to form two different color offsets for my acorn image. All my edges were inked with Ranger's Vintage Photo distress ink. Look at the sweet little puppy and girl image in that acorn! I used GIMP to edit the top of the acorn (no lettering now). I embellished this little acorn with some fabby Fallen leaves hand dyed silk ribbon, burgundy leave trim, brown diagonal stripe ribbon, and vintage button with mint jute string all from Really Reasonable Ribbon. My card is perfect for the Autumn Colors and Ribbon challenge they have going on at RRR right now. I am so happy to have found the leaves in many colors!! They are one of my faves!! More vintage buttons with mint green jute string! I just love the bunny with her carrots, the crow and chipmunks and little mouse....too cute!! Awww...little hedgehog, frog and my favorite Squirrel!! Here is a close up of part of Psalms 85:12. I used pop dots to elevate each word. They sit on top of the ivory jute ribbon, also from RRR. I used some more of the brown and white diagonal ribbon to add a bow, and some more leaves to tuck in behind the words. Somehow I have misplaced my spool of brown sugar baker's twine. As soon as I find it, I will be adding some of it to my project :0). Sugar Creek Hollow this week!! Sugar Creek Hollow Week #29 Pretty in Pink! It is week #29 at Sugar Creek Hollow and our challenge this week is "Pretty in Pink." We would love to see your vintage or shabby chic creations created this week with Monochromatic shades of pink! I just LOVE pink, so I had a lot of fun creating my card this week. sweet image that I found at the Graphic's Fairy with pop dots as well. I took a piece of the ivory jute trim, inked it with Worn Lipstick distress ink from Ranger, and tucked it under my little "Dream" sentiment that I created with a scrap piece of pink card stock. I used some pink flatback pearls (from Pro 31 Designs) as well as some pink sheer polka dot ribbon (from Really reasonable ribbon) to finish off the top of my diecut. In the close up above, you can see the Ivory jute trim (which I also inked with Ranger's worn lipstick to match), and the fabby bow that I created with the yummy pink with polkadots sheer ribbon, both from Really Reasonable ribbon. The soft pink rosettes are from my stash. Finished off the edges with the Pro 31 Designs pink blingy bling trim. I used one little blingy bling for a broach on my sweet little Girl image from the Graphic Fairy. The Yummy pink heart shaped pearls, ivory leaf trim (which I inked with worn lipstick to match), and pink mulberry roses all came from Pro 31 Designs. So, lets see your Monochromatic Shades of Pink Shabby Chic and Vintage Creations this week!! Don't forget to link up to Sugar Creek Hollow!! I had so much fun playing with the new Halloween Ephemera and Digital Papers that Leanne at Gecko Galz gave me this month! Would you like to win some free images? Well....check out this post. I found some adorable Middy Bitty Polka Dot Kraft bags from Really Reasonable Ribbon. Used one to create a pocket to hold my Fangtaskular Gecko Galz Pocket and tags!! Here are some photos of the individual pieces below. I used my crop o dile to punch holes and add grommets to all my pieces. I inked all my edges with Ranger's Vintage Photo Distress Inks. I used the May Arts Pumpkins and Brown Leaves from Really Reasonable Ribbon through out my pieces. I used some vintage looking brown lace and brown sugar baker's twine to hang my ornament. The leaves remind me of fall cornstalks. I LOVE Fall!! I tucked in some scraps of ivory jute ribbon, and added a bat that I had punched out. The paper through out is from the Gecko Galz Digital Paper pack. Found some scraps in my area and wrote out all my little sentiments, and inked them and used pop dots to elevate them on my pieces. I just love the labels that Leanne created at Gecko Galz. She is amazing!! Check out her blog for FREE digital sheets! 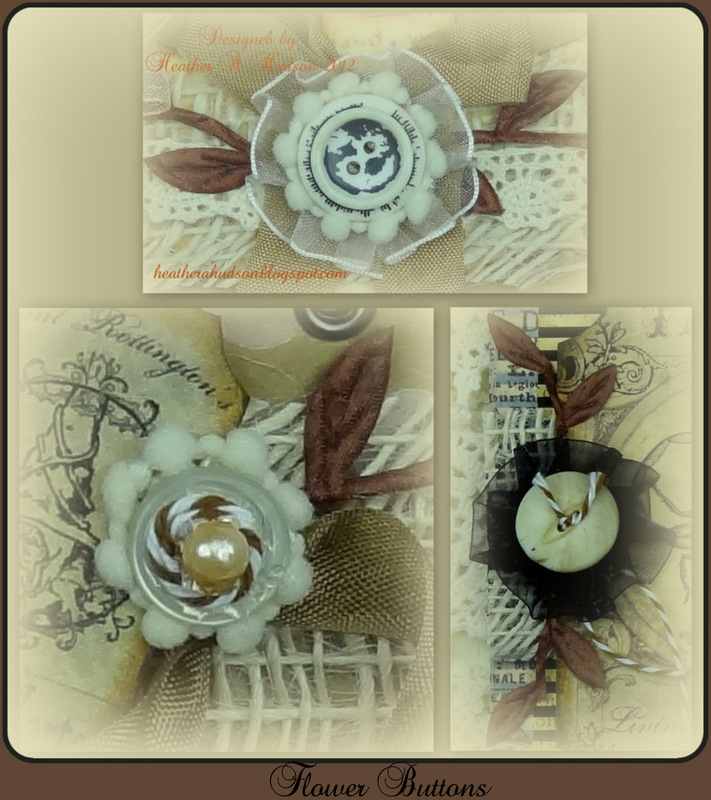 Here you will see how I added some of the sheer box pleated black ribbon to create a button flower. I created a bat template and used it with all the Gecko Galz Hocus Pocus Digital papers. I used two of them (one on the front and back) of the bat below. Untie the Champagne sheer oraganza ribbon and it is a Halloween Ornament! Otherwise you can hang the whole Halloween pocket on your Halloween tree. For this button flower I used the white mini pom poms trim and white sheer box pleated trim from RRR. You will see where I added some of the fabby vintage seam binding in tobacco. Some more of the ivory jute ribbon and may arts leaves. More Dred warts and Tasty Scorpions anyone??? LOL I just LOVE the images!! Here is a close up of the button flowers. Gecko Galz Yahoo Groups Challenges. Why not treat yourself to some fabby ribbon too! Bonnie at RRR ships the next day...so you get your goodies quick! This is week 27 at Sugar Creek Hollow and our challenge is for you to use FABRIC (no lace or ribbon) in your Vintage and Shabby Chic Creations! I had a lot of fun creating my project this week!! Here it is...it is FABULOUSLY SHABBY!! I started out with a Pink polka dot Big Bitty bags from Really Reasonable Ribbon. I used one bag and created 4 pockets out of it. I inked the edges with Ranger's Old paper distress ink. Used my Cinch to punch holes and add the wire binding. Here you can see the Vintage Pink Seam binding, Pink Jute, and Ivory burlap trim that I used on my cover. They are so dreamy!! Below you can get a good look at the piece of fabric that I tore, and then did a quick and easy running stitch down the center so I could gather it up. I used some beading wire with some yummy looking glass beads to add a little somethin somethin to my mini album. You can also get a great look at the pink flatback pearls and Cotton Candy baker's twine! I put the seam binding on the diagonal, and only put glue at the to ends, so that the tag could slide in behind it. The photo spot was placed on pop dots to give the page a little dimension. Ranger's liquid pearls in Bisque add a great finishing touch to the photo spot. The tiny tag can have some journaling added to it. Above I used a larger square die for my photo spot. Again elevated with pop dots so that the journal tag can slide in behind it. Turn the page, and here is the next set of pages. The first I created a pocket with the Burlap, covered it with seam binding and the May arts leaves. Added the bakers twine and vintage buttons! Here is right side. I used a Rectangle Die, and the same embellishements, just in a different design. Here is the last set of pages below, photo spot and three more Mellissa Francis mini tags for journaling or little photos. A couple more close ups. Here is a close up of the larger premade tags. I used all eight from the set, I simply glued them together so I would have pretty things on the front and back :0). Here are all the itty bitty tags!! So get your creative juices going, and make sure you visit the rest of the Design Team member's blogs for inspiration!! I can't wait to see what you create and link up at Sugar Creek Hollow!! Gecko Galz goes Cyber & Chance to win Big!